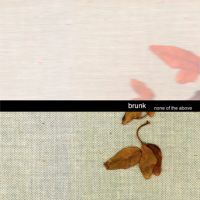 ‘none of the above‘, the follow-up to ‘ sept 2003 ‘, is a further exploration of the melancholic and more accessible side of brunk. It has a quiet vibe and mostly slow songs. Once again these songs are made of overdubbed and edited layers of cut-and-pasted guitars, softwaresynths, samples, beats etc; with at the same time lots of improvised elements and spontanuous aspects, uncorrected imperfections and a perhaps slightly naieve ‘homerecording lo-fi’ touch.